What next for the Globe property? Columbia Point Master Plan: Task force created clear guidelines for development along Morrissey Blvd. including the Globe property.After years of “maybe it is, maybe it isn’t” for sale, it appears that the Boston Globe property on Morrissey Boulevard is really on the market as a number of developers have prepared bids to purchase the site. The big question for its neighbors, of course, is what will replace the Globe? Several years ago the city was faced with several major properties on the boulevard being actively considered for new development. These included the air rights above the MBTA property outside JFK-UMass station, a parcel between the station and the Shaw’s supermarket parking lot, the market itself, the adjacent building that houses radio stations, the old Ch. 56 property, and the Globe. 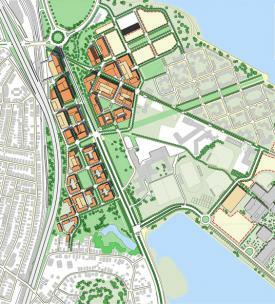 Additionally, there were plans being made for the other side of the boulevard – significant and substantial new buildings at UMass Boston and a redevelopment of the Bayside Mall site. The Boston Redevelopment Authority (BRA) rightly called a “time out” on individual project proposals to prepare a master plan that would coordinate and integrate all the new uses for the several sites across the Morrissey Boulevard/Columbia Point peninsula. Behind this decision was the recognition that the area is truly what transit-oriented development should be all about. There is the JFK-UMass station, host to two branches of the Red Line, a commuter rail station, and several bus routes; downtown Boston is three miles away; Cambridge, with its on-going innovation economy, is but six Red Line stops down the tracks; Route 93 has on/off ramps near to the sites; and a growing urban university, UMass Boston, shares the peninsula. Beginning in 2008, the Columbia Point Master Plan Task Force met regularly for three years and submitted its master plan in June 2011, a time when the realities of the Great Recession were putting a major damper on any new development for the boulevard and elsewhere. So what will replace the Globe? I believe that whoever buys the property will have to recognize that what they do will set the stage for additional development along Morrissey Boulevard. A narrow focus on the Globe site itself is a mistake; the sale could be the catalyst for a terrific new Morrissey Boulevard neighborhood, a boon to the city and its local neighbors. Or, it could be a missed opportunity. I know that the Columbia Savin Hill Civic Association will be actively involved as things begin to take shape and I expect that the city will be ensuring that Boston gets the maximum benefits (jobs, housing, property taxes, desirable spaces, retail) from new development along the boulevard. I encourage other Dorchester residents to get involved. We are likely to have only this one opportunity to develop something special for Morrissey Boulevard neighborhoods. Don Walsh of Savin Hill is a former chair of the Columbia Point Master Plan Task Force.